New to the market this weekend see’s the launch of the first batch of spirit from Moray Distillery Ltd. Based in the old Cathedral city of Elgin, in the heart of Speyside with direct access to a wide range of botanical sources such as woodland, grassland valleys, riverside and coastal terrain whilst not forgetting the essential access to highly talented copper-smiths. The founder, Jill Brown, has some creditable history in the drinks sector, with a multi-award winning liqueur business Berry Good under her belt along with an honours degree in Rural Business Management & Agriculture, she is a third generation licensee and decided in 2015 to follow a long term ambition to join ranks of the craft distillers having previously worked for the Scottish Government. Avva Scottish Gin is made with using a bespoke Speyside copper still called Jessie-Jean (J-J) named after the founders grandmothers. Sometimes it is worth taking the extra time to do things well, in this case exceptionally well. 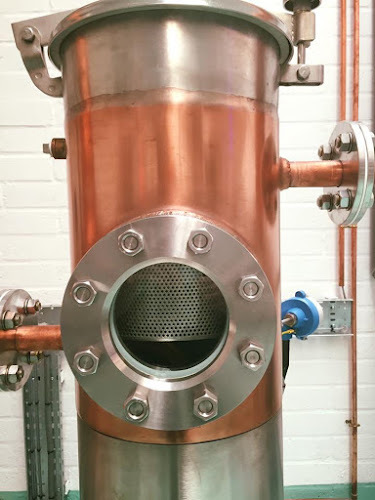 It is really easy to purchase an ‘off the shelf’, imported copper-still but being based in the heart of distilling country, the skills to make such essential pieces of kit were on the door-step. Three streets away to be exact, Speyside Copper Works hand-crafted J-J. She is small at only 250l but my what spirit she has, like the ladies she’s been christened after. The iconic Cathedral has been the inspiration for key elements of the design. Below the rose window there are ten arched windows; the final recipe has the lead botanical of Juniper which is complimented by 10 other botanicals including rowan berries, angelica root, lemon peel and dandelion to name but a few. There is no mistaking this is a London style dry gin, with reviews of ‘clean finish, well-balanced’, ‘ooo very moorish’ whilst others simply smile and nod ‘this is a great gin, well done, congratulations!’ However people tend to buy with their eyes first and the attention to detail is apparent from the first glance, Avva Scottish Gin is presented in a traditional apothecary styled bottle and finished with a wooden topped cork which is de-embossed with the rose window, the paper-type used for the label again is traditional with highlights of matt copper on certain elements to reflect the use of the copper still in the gin’s production. The name Avva means: ‘a respected grand-mother, respectable elder woman’ in the Indian language of Dravidian, in Hebrew however, it means to overturn or ruin which links the reputation that gin had as ‘Mother’s Ruin’ from the Hogarth era. Linking the respected grandmother is of course J-J, named after Jill’s grandmothers. 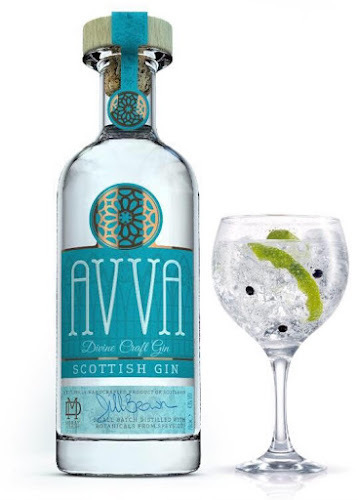 Avva Scottish Gin launches in the year that the UK’s most famous and respected grand-mother celebrates her 90th birthday, HRH Queen Elizabeth – who is also partial to a Gin & Tonic we are led to believe. Along with a slight play on words ‘I’ll Avva G&T please’ seems a logical name for ordering a drink. The first batch will retail direct to consumers via the online shop from 14th October 2016 and allows gin connoisseurs to select their own number from the first batch at £38 for a 70cl bottle. There after selected trade and retailers (independents) will be sent their orders.